Denis Dale rounds up the latest senior amateur golfing action from around the country. Local member John “Wheels” Wheeler (pictured) was a proud man as he donned the coveted green jacket awarded to the winner of the 2015 National Senior Masters. A very popular member at The National, Wheeler had led after the opening round with a brilliant round of two under par 70 on the Moonah course. He followed this with a second round 74 on the magnificent Old course to find himself two strokes behind leader Barry Tippett (Thirteenth Beach). Tippett had opened with rounds of 71-71 to set a hot pace at two under par. In a tense final round played on the most challenging Ocean course Wheeler admitted to feeling quite nervous playing in the final group. However, he handled them well and in difficult and windy conditions his score of 77 was good enough for a three stroke winning margin. This was the title Wheeler most wanted and his rounds of 70-74-77=221 created a tournament record. It was the first win for Wheeler in an Australian Senior Ranking event and he certainly picked a great event in which to break through. The three courses are all world class and the field was the strongest possible and would not have been out of place in an Australian Senior Amateur Championship. Second place went to a trio that included NSW senior Simon Bracegirdle (Killara) and two Victorians, Ian Frost (Bendigo left) and Barry Tippett (Thirteenth Beach). Bracegirdle (74-75-75=224) is now a member at The National after a long and well performed career at the Killara club in Sydney.. Frost (71-75-78=224) has performed very well in senior events in recent years and is not only one of Victoria’s best seniors but also one of the best across the country. Barry Tippett was the defending champion and led the field into the final round after two great par-breaking rounds of 71-71 on the Moonah and Old courses. He slipped a little with is final round of 82 that saw him fail in his effort to be the first two time winner of the green jacket. However, he did share second place points and has now climbed into second position on the Australian Senior Ranking table behind fellow Victorian Gordon Claney. Sharing fifth place were leading West Australian senior Ian McPherson (74-77-75=226) and another Victorian Greg Rhodes (73-74-79=226). 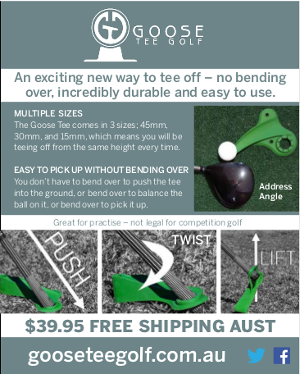 McPherson has been an Australian representative for several years while Rhodes was the recent runaway winner of the NSW Senior Amateur Championship. Both Rhodes and McPherson will join Tippett and Frost in the Australian senior team that takes on New Zealand in July this year. This year’s National Masters field was the strongest ever, with four of the past five champions competing along with the cream of Australian senior golf and several top level visitors from New Zealand. As always the organisation was at the highest possible level, all three courses were in beautiful condition and the hospitality of the club warm and generous. Tournament host Adrian Barr has developed an event to be proud of and there will certainly be a high demand for a place in the field next year as it continues to grow in status on the senior amateur circuit. The incredible weather that lashed Sydney during May forced the cancellation of the 2015 Sydney Senior Classic. This 54-hole event was to be played at The Lakes, The Australian and Avondale Golf courses. Heavy rain and strong winds forced players from the course quite early in the opening round at The Lakes and the continual wild weather made play on these three and any Sydney course impossible. Obviously there were many disappointed senior golfers who had looked forward to playing on these three world class courses. The entry list was perhaps the best ever with golfers from interstate and New Zealand making the trip to Sydney. Unfortunately nothing can be done to control the weather and with a busy year ahead it was not possible to reschedule in 2015. The 2015 NSW Senior Order of Merit competition continues with fifteen of the forty seven scheduled events now complete. The NSW Veterans Stroke Play Championship was a new addition to the Senior Order of Merit competition with ranking points being allocated to players in the 54-hole championship. The tournament was played on three of the better courses in Sydney’s west – Richmond, Glenmore Heritage Valley and Stonecutter’s Ridge. Winning the 54-hole championship for an impressive fourth occasion was 66 year old Col Kenning. The Kiama Golf Club member entered the tournament on a handicap of 1 and promptly shot rounds of 71 at Richmond, 72 at Glenmore and then a fine 74 at the Greg Norman designed Stonecutters Ridge to take the title by five strokes from Leonay’s Laurie Cupples (72-75-75). “I put three good rounds together,” Kenning said after being presented with the Des Coady Shield. “Three over for the tournament, you’ve got to be happy with that” . Kenning also won this championship in 2010, 2011 and 2012 and was runner-up last year. 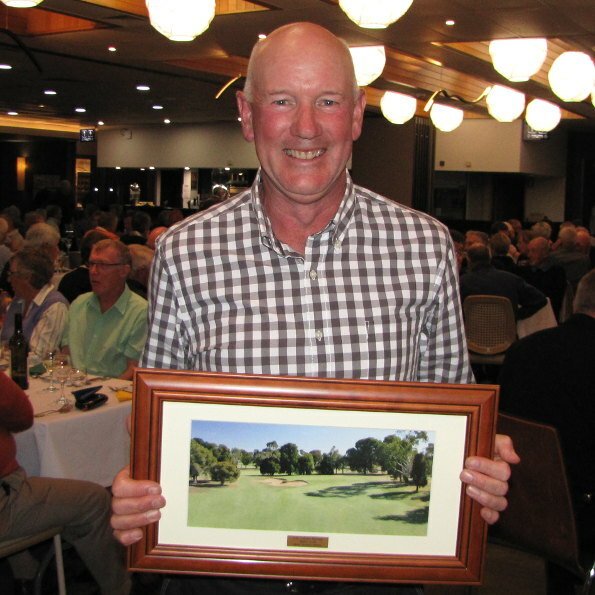 Laurie Cupples (Leonay) continued his good form with a win in the Bowral Jubilee Cup – Seniors. On the tight course Cupples had a good round of 75 to share the leading score with Dunheved’s Graeme Howland with Cupples awarded the major prize on a countback. In third place was Bankstown senior Stephen Stanton. With fifteen events completed Long Reef senior Ross Bockamn maintains his lead in the year-long Senior Order of Merit with Dale Tapper (Bayview) in second place and Greg Stanford (Mona Vale) third. The competition for the Doug Bachli Trophy (scratch) and Paul Lulofs Trophy (handicap) continues and with fourteen events completed has almost reached the half way mark. 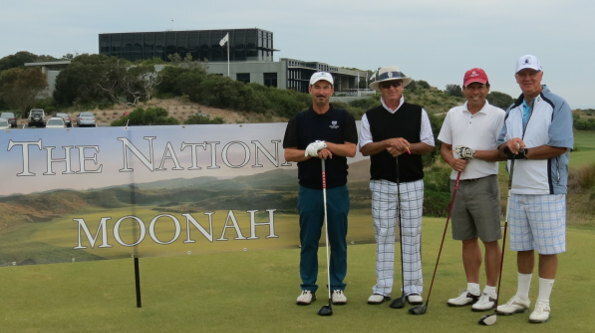 The 2015 Cobram-Barooga Senior Open tournament continued its tradition of being one of the most popular events on the Victorian Senior Order of Merit calendar. The host club warmly welcomes all visitors and it is not surprising that many make a return trip each year. In the first round a field of 120 men played a stroke competition for Doug Bachli Trophy points on the Old course. At the same time a field of 140 (80 ladies and 60 men) played in a Stableford competition on the West course. There were 75 clubs represented from Tasmania, South Australia, NSW and Victoria. In wonderful golfing conditions Bendigo senior Ian Frost opened with a par round of 72 to take a one stroke lead over Michael Jackson (Yarra Yarra) with Ross Banks, Gary Hunt and Ross Percy next on 74. The second round was played under contrasting weather conditions. Winds were gusting at up to 50 km per hour with the sun blocked out by a dust storm. Best score of the day was a gutsy, no birdie 76 from Alan Bullas (Commonwealth), closely followed by overnight leader Ian Frost (Bendigo) with a 77. Frost held a two stroke lead over Bullas and Michael Jackson heading into the final round on the Old course. With a seeded draw adding extra pressure it was an exciting final day. On an overcast but generally fine day Ian Frost (72-77-76=225) handled the conditions well and his round of 76 saw him finish with a four stroke winning margin. Frost had the distinction of a wire-to-wire victory with Yarra Yarra’s “Super Senior” Michael Jackson (74-77-78=229) finishing in second place. Third place went to Greg O’Brien (Howlong 75-77-73=230) and Alan Bullas (Commonwealth 77-76-77=230). 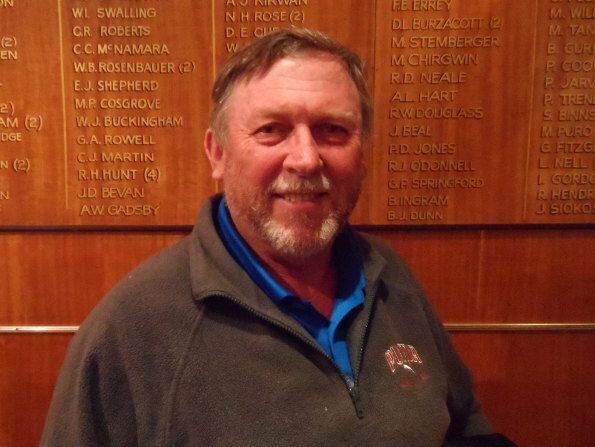 Cobram Barooga member Colin Rankin utilised his local knowledge to take this year’s nett event playing off a handicap of 13 with a three round nett total of 213. Russell Williams (Leongatha) finished in second place with a score of 214 with the defending Paul Lulofs Trophy champion Ignatius Duivenvoorden rounding out the top three places with his nett score of 219. Victory in this event has further lengthened the lead Ian Frost has in the 2015 Doug Bachli Trophy. The McLeod PresCare Queensland Senior Order of Merit event attracted a very pleasing field of 76 players (44 men and 32 women).The course was a fair test and given the heavy overnight rain was in good condition. It was a very hot and humid day making it a real test of endurance. A very good field of 74 players (61 men and 13 women) competed in the Carbrook PresCare Queensland Senior Order of Merit event. It was a perfect day for golf with the course presented in immaculate condition. Carbrook is a course that gets better every time it is played and this time the field was able to play the new seventeenth hole that had just been opened. May 7 was the date for the inaugural Hills PresCare Queensland Senior Order of Merit event at The Hills Golf Club with a field of 34 players. The weather was perfect and the course presented in great condition after the extreme weather of the previous week – a fantastic job by the course staff. The Hills is one of the longest courses in Australia and it proved to be an enjoyable challenge for the senior field. Four events have now been completed in the 2015 South Australian Senior Order of Merit with Phil Smith from Tea Tree Gully currently leading the race from Steve Ross (South Lakes) and Chris Everett (Tea Tree Gully). The most recent events been played were at Mt Osmond and Flagstaff Hill. It was pleasing to see that the course staff had worked hard to present their courses in fine condition. All that was needed was for the players to enjoy the cool autumn Adelaide weather and play some good golf. There is now a break in events until a new SA Order of Merit event at Glenelg Golf Club in late August. Mid-September has an Australian Senior Order of Merit ranking event played over 36 holes at Kooyonga and Grange Golf Clubs. Following straight after is the final event of the South Australian Order of Merit year, the 2015 South Australian Senior Amateur Championship at Links Lady Bay Golf Club. All of these courses are highly rated championship courses and the organisers look forward to a good number of interstate entries to join with the local seniors in enjoying the competition offered.